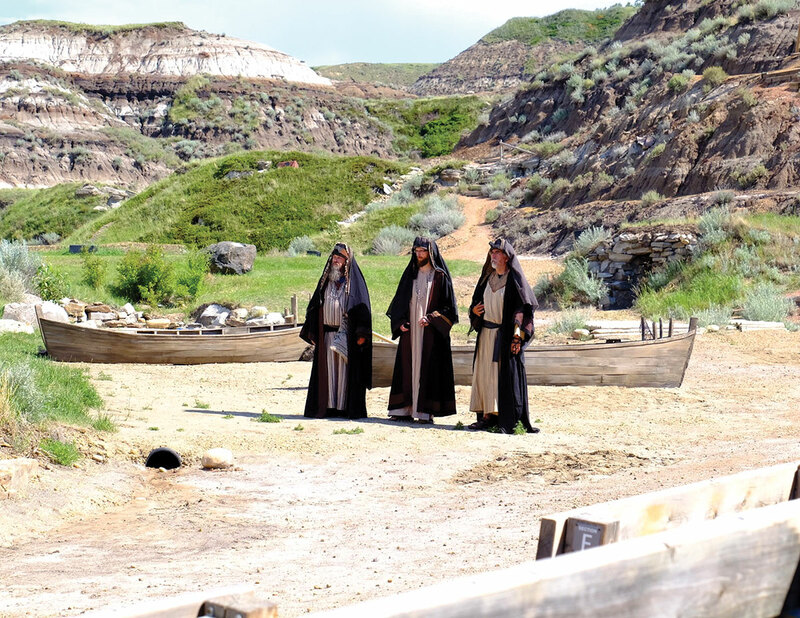 In Drumheller, a town of eight thousand people, located in the badlands of Alberta, “the greatest story ever told” is being told again. 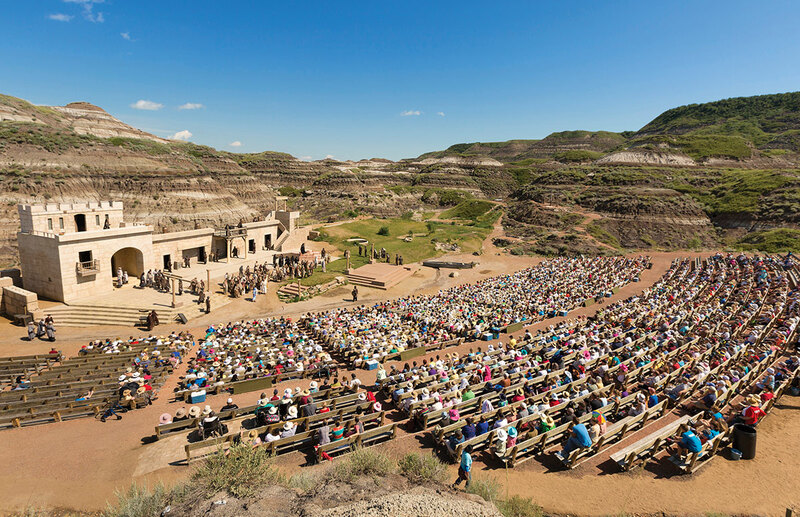 Each summer, since 1994, among a wealth of hoodoos and dinosaur bones, the Canadian Badlands Passion Play has depicted the birth, life, death, and resurrection of Jesus Christ, as told in the Gospels of the New Testament. 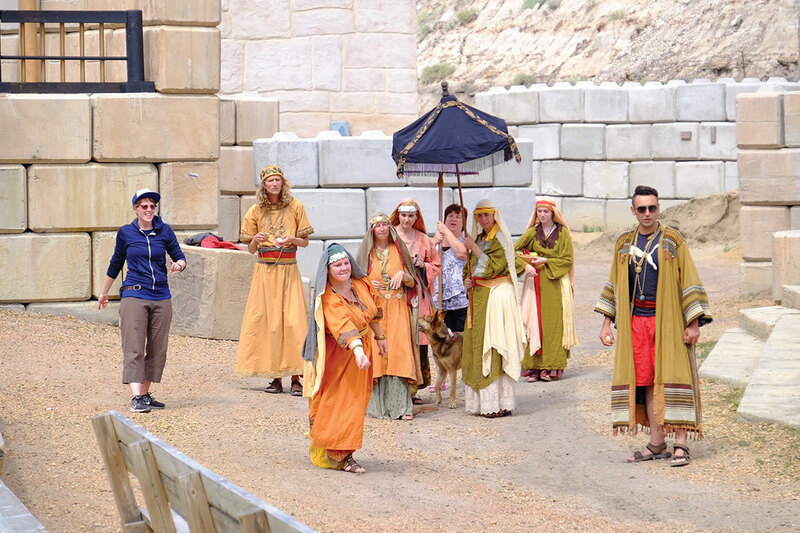 The play runs on a combination of grants, donations, ticket sales, and a cast of volunteers—Christ, Pontius Pilate, Gabriel, and Christ Understudy receive modest honorariums—but is not a church-basement production. It has an annual operating budget of nearly a million dollars, and is one of the region’s staple tourist attractions. The play’s aesthetic quality rivals those of the nation’s grandest theatre festivals, with smoke bombs, original scores, and nearly two hundred actors (mostly human, with a supplement of horses, dogs, sheep, and other animals), who perform in a naturally created amphitheatre that seats twenty-seven hundred spectators. The stars of the show are housed in trailers on-site, while the rest of the troupe stay in a campground, located ten minutes down the highway. In February, 2017, I joined the play’s cast, in the role of Herod Antipas, a figure who, despite his significant architectural and political achievements, is remembered mainly for his complicity in Christ’s crucifixion. My reasons for sacrificing an entire summer to perform in this play—one I had seen only via its crescendoing online promotional videos—were intangible and vague, even to me: a combination of my interest in the ways art survives in hostile climates, my fascination with what must be one of the last publicly funded exhibitions of fundamentalism, and a desire to write about a community that possesses inordinate political power while remaining notoriously reclusive. It might also have had something to do with wanting to see a donkey trot a fisherman into the Holy Land, Judas touch his lips to the cheek of another man, and a saviour hoisted high above to have a lance threaded through his ribs, the torrent pouring forth like a punctured cloud that drenches with dark rain. One afternoon, I made lunch plans with Jessica, the play’s co-director. I planned to ask her to confirm my theory that she was not religious—I’d noticed she did not bow her head during a previous day’s prayer, something I saw because I wasn’t bowing my head either. I solicited restaurant suggestions from the cast. Hardly any of the actors lived in Drumheller. Many were from surrounding cities and agricultural towns, and some commuted from as far away as northern Alberta and Saskatchewan. Diabolos and I carpooled from Calgary each weekend. “Which restaurant is best?” Jessica asked. Barrett surveyed our surroundings. A dust devil swirled across the stage while long-winged birds circled above. “Do they have vegetarian options?” I said. Barrett squinted at me. His well-gelled cowlick was like the brim of a baseball hat against the sun. Drumheller’s Vietnamese Noodle House, wedged between a Baptist church and the Tastee-Delite ice-cream shop, offered exactly one vegetarian option. “White roll,” the server told me. I was unsure if he meant the roll was white or was for white people. I said, “Someone once asked me, ‘Aren’t all plays passionate?’” and we giggled at the brimstone that awaited the unaware hordes. Jessica first came to the Passion play through a posting on an actors’ union job board. After this year’s production, she will have worked on the show’s direction for three separate seasons, to a combined audience of more than thirty thousand souls. These clichés are alive and well within the Badlands play, particularly in regard to the whiteness of the actors. Also, thanks to the unparalleled mastery of the costume department, the cast’s flowing robes were inexplicably striking—Caravaggio-esque, even—and I had spent entire afternoons hypnotized by the tattered strands of Demon Possessed Woman’s kaftan coiling in the summer breeze. This did not surprise me. We were, generally speaking, a conservative group. This season’s scandal was the casting of a female Holy Spirit, which outraged some cast members. There was also pushback to casting female angels and to dressing the male angels in rose gold and aquamarine. 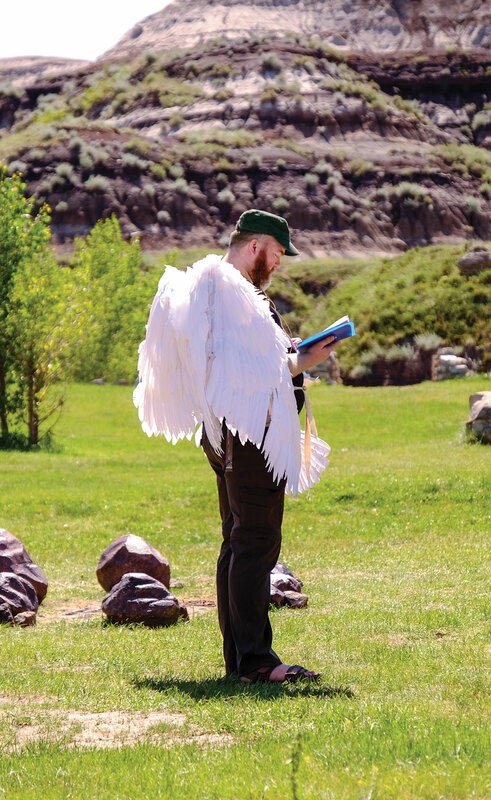 In 2006, partly in response to declining ticket sales, the Canadian Badlands Passion Play began debuting a new script every five years, rotating through the New Testament’s Gospels. The years 2006 to 2010 were the wildly adored Matthew years; 2011 to 2015, the less loved though still successful John years. We were now into the second season of the precarious Luke era, a Gospel widely considered the weakest of the four. Each new script must be approved by the script committee. The script committee is composed of three board members and usually a member of the local clergy, all of whom, the organization’s Board Policy Handbook states, must “subscribe to the basic teachings of the Christian faith as expressed in the Apostles Creed.” The committee maintains the power to not only supervise the writing of the Passion play script but “approve the intent and use of the script.” According to Barrett, the script committee expressed serious reservations about having the Holy Spirit written as female. Barrett revised the script to obscure the role’s gender, allowing the committee to grant approval as they tarried in male-normative assumptions until auditions, where Barrett immediately cast a woman. Jessica worked another contract the previous summer, so this was her first time directing the new script. I asked if she liked the play. Even senior members of the cast were perplexed. “Which of you is older?” Jessica asked Jacob and Isaac during our most recent rehearsal of the genealogy sequence. The father-son combo answered with wide-eyed silence. “There’s an old joke about us Catholics,” Diabolos told me one morning on our ride to Mass, “that if you asked us to look up the Book of Acts, we’d go, ‘Is that Old Testament or New?’” I laughed so loud I was worried I’d oversold it, until I remembered how gifted a thespian I had become. Jessica believed, however, that a large portion of our audience was secular. “People come for the spectacle,” she said. “People come up to me after the show to say they’re non-religious.” It seemed strange to me that someone would weave their way through the play’s exiting hoards just to approach one of the directors and say, “I do not believe in eternal life,” but it seemed even stranger to believe that a non-religious person would be able to follow what is happening onstage. Why, pray tell, does Jesus sweat blood in the garden of Gethsemane? Why does Pontius Pilate kill Judas in one scene, only to have Judas enter in the next? Why does a voice-over of the Holy Spirit whisper to Christ, “Receive my power,” apparently instilling in Jesus the ability to enclose Diabolos in a Jedi force field? A week earlier, my partner, Litia, accompanied me to Drumheller for the first time. I was worried the cast would be able to smell the original sin on her, so I made her stick close. I figured Litia’s assumption that the harbinger of Christ was half angel and half horned horse was as bad as it could get, until she watched scene 22c: The Transfiguration, in which Christ hikes up a mountain to be visited by apparitions. “Is that Father Time?” Litia said, referencing a spirit’s elegant robe, gnarled staff, and unbound mane of silver hair. In the restaurant, my meal tasted exactly how the word “white” sounds. I opened the jar of hot sauce, and from the smell alone my eyes bloomed into poisonous red flowers. I pushed the limp rolls around until the rice paper broke and the bean sprouts surged across my plate. I asked Jessica how the directing team was dealing with the stress of living in the shadow of the previous year’s production. “I wasn’t sure that people knew that,” she said. These misgivings are especially disheartening because, at last count, the play, including a half-hour intermission, was estimated to be running at three and a half hours. Only from her recoil did I realize how dismissive I had become, my presumption that a belief in Christ turned you into the Elephant Man, unwanted and unallowed in public. Like somebody can’t enjoy both X-Men and Elijah as, admittedly, I once did. Behind the restaurant’s till, the teenage hostess turned up the radio on Lady Gaga’s “Just Dance.” Jessica took her last, perfectly seasoned bite, and I asked if she considered herself a feminist. “I’m not like—,” she said, raising a clenched fist. “What does this mean?” I said, repeating the gesture. “But isn’t that the definition of a patriarchal society?” I ask. Jessica shrugged. And what was I supposed to do? Tell her that what she believes is wrong despite her having lived it? Demand her argument give way to the infallibility of my own? At some point, the path of logic and belief inevitably forks. Is it better to slow-clap the enlightenment of those who take the former route or to envy the wide-eyed wonder of those who elect the latter? I shrug back. In astounding unison, they rolled their eyes. Midwife 3 was seated at the table behind us, studying her script. I could tell by how her irises stayed still that she was no longer reading. It is difficult for a non-religious person to understand how subversive this sentiment is. To call Him a Her is not simply an expanding of definition—it concedes a level of fallibility in those who have written what we should believe and how we should believe it. Because if God isn’t a dude, why has He been such a bro to us: employing us as popes, enshrining the ownership of wives within the Ten Commandments, and declaring the use of condoms a mortal sin? Midwife 3 closed her script and shook her head. “But isn’t that just a translation thing?” Susanna said, and Midwife 3’s smile widened at Susanna’s open insubordination. God’s male gender largely is a product of the Bible’s English translation, since English doesn’t have a gender-neutral pronoun. Previous versions of the Bible written in other languages allowed the use of masculine pronouns to describe God without prescribing gender. Also, as Carpenter 1 pointed out to me, in the Hebrew Bible, the pronoun used to refer to the Holy Spirit is categorically feminine. From outside came a raucous clamber: the cast had either lifted the Lord or dropped Him. In my previous, hedonistic life, I would end each interview by asking, “Do you have any questions for me?” However, in my current life of theatrical religiosity, I’d done away with it, for fear I would be asked, “Do you believe in God?” But as Jessica and I waited for the bill, she said, “Are you enjoying being in the play?” and somehow this question was even more complicated. I said that the play had a tenderness I never expected, that we were beautifully reminiscent of A Midsummer Night’s Dream: our little group of mechanicals, rehearsing in the thickets, planning our big show, and wringing our hands white with the worry that no one would come. The Canadian Badlands Passion Play is also one of the cruelest environments I have ever been in. Chuza told me he was reading a book that proved Christians are responsible for all positive aspects of civilization—everything from hospitals to universities, aqueducts to post offices. Roman Soldier informed me it was morally wrong that Litia was physically stronger than me, since I would therefore be unable to protect her. Herbalist decreed that unwed partners should be barred from church, a barring that would include none other than Roman Soldier and his girlfriend, Daughter of Widow of Nain. Ever since I agreed to spend all summer with Jesus H. Christ, who repeated ad nauseam that we shall all be judged, I realized how inept I was at separating good from bad—the two now striking me as inextricable. The man who does decide if the L.G.B.T.Q. crowd get through the pearly gates (at least according to Catholic theology and newspaper comic strips) is Simon Peter, who, as we pulled into the campground, was hacking through the rind of the largest watermelon I have ever seen—an ovoid the size of a Galapagoan turtle. From her trailer, Baptizee 4 cranked Norman Greenbaum’s “Spirit in the Sky” to a volume that shattered the birds out of the canopy. The electric guitar marched into the first verse, and three Villagers from neighbouring trailers emerged to dance alongside her. The women improvised actions to go along with the words: “Friend” was a self-hug, and “Jesus” was the unfurling of your arms to crucifixion pose; “Die” equalled a thumb dragged across the throat. During the musical interlude, Baptizee 4 sashayed over to Simon Peter. He stopped cutting the watermelon, now absorbed in the suppleness of her air guitar. She shrugged her tank-topped shoulders, limboing deeply to play the high chords, and her neck and chin stretched into a single long line. The drum roll cued, the lyrics returned, and Baptizee 4 uprighted and strutted back to her awaiting entourage, while I thought about every bad thing I’d ever done that I knew I’d get away with. Simon Peter’s knife hovered, the red dripping off the blade.